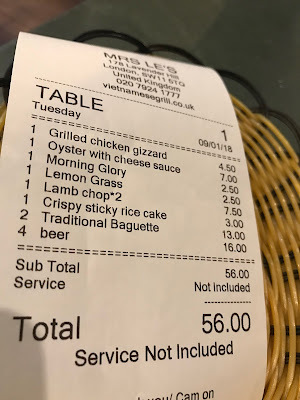 I've said before on this blog that the real measure of a healthy dining scene isn't what's going on in the multi Michelin-starred high-falutin' fine dining establishments, but instead what you get for £30-40/head with a glass or two of wine. Don't get me wrong, I love places like Moor Hall, and L'Enclume, and the Fat Duck, of course I do - you'd have to be missing a soul not to have the time of your life eating dinner there, assuming you can stomach the bill - but they exist in their own international jet set tier of restaurants, separate and apart from anywhere you'd just pop into of a cold Tuesday night because you didn't fancy cooking. And the sad reality is, if you do look at the vast majority of high streets in towns and cities up and down the country, it's still grim pickings for the food-lover. Cookie-cutter Italians like Ask, Zizzi or Prezzo dominate, with fried chicken shops and Nando's taking up whatever grade A spaces are left. Some days, and in some towns, it seems we are further away than ever from having a healthy independent food scene and nothing can save us from the relentless March of the Chains. So what can we, who care about eating out and eating well, do about all of this? Only to find your precious local gastropub or bistro, with its seasonal menu cooked by proper chefs who get up early to prep all the fresh ingredients themselves, and where it's all served by people who love what they do, and you give them your custom. And if you happen to find yourself in Kent, and need some inspiration for how to find such a place, well let me tell you about the Corner House in Canterbury. The menu at the Corner House is familiar and comforting as a hug from an old friend. This is, of course, exactly how it should be - you can't win hearts and minds by being stubborn when it comes to traditional gastropub favourites. So there's pork scratchings and sausage rolls, roast sirloin and Yorkshire puddings. 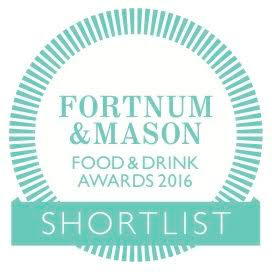 There's triple-cooked chips, and braised shoulder of lamb for two. There is, in short, something for everyone, and judging by the happy mix of young and old we sat with on Sunday, they know their audience well. Starters all looked worth ordering, but after much deliberation we ended up with chicken liver parfait (usually a good litmus test of a kitchen) and venison carpaccio. The venison had a good gamey flavour, was seasoned well, and was dotted with an intelligent selection of seasonal bits and pieces, including parsnip "fries" and puréed beetroot. It brought to mind a similar dish made up in Lancashire at the Parkers Arms, and as the Parkers is one of the very best restaurants in the country, that's about as big a compliment as I can pay. The parfait, sweet and fluffy with a luxurious meaty flavour, came topped with an interesting port jelly, which dissolved in the mouth and complimented the liver perfectly. My friend, a chef, wants it to be known that she thought the parfait was a bit too sweet, but I didn't at all and I'm writing the review so there. The main course presented a dilemma. Ordinarily, custom on these review trips would dictate that in order to sample as much of the menu as possible, I and my dining companion would choose different dishes for each course. Unfortunately, the existence of a game suet pudding on the menu provoked a short but... intense discussion on the subject of who should do the right thing and order the cod, or polenta, or beef, or something I mean come on, and with neither side being willing to compromise (I mean it's not like she should be grateful for a free weekend trip to Canterbury but you'd think it might have registered as a factor) we ended up with a suet pudding each. Fortunately, they were pretty much perfect - stuffed full of pigeon, pheasant and partridge with a glossy game jus, and extremely impressive work with the suet. Oh, and lovely buttery mash to go with it, too. Someone really knows their pastry at the Corner House, because the desserts conspired to be even more impressive than the savouries. Upside down pear & ginger cake (beautifully balanced sweetness and fruit flavour) came with a honeycomb ice cream so rich it had somehow developed tones of woodsmoke alongside the caramel. And tonka bean creme brulee had a great texture contrast between the crunch of the sugar glaze and a supremely clean, smooth custard, topped with some chunks of delicate poached pear. Yes, perhaps each of the desserts could have done with one fewer flourish amongst the toppings, but these were still superb examples of the pastry section's craft. Seriously impressive stuff. 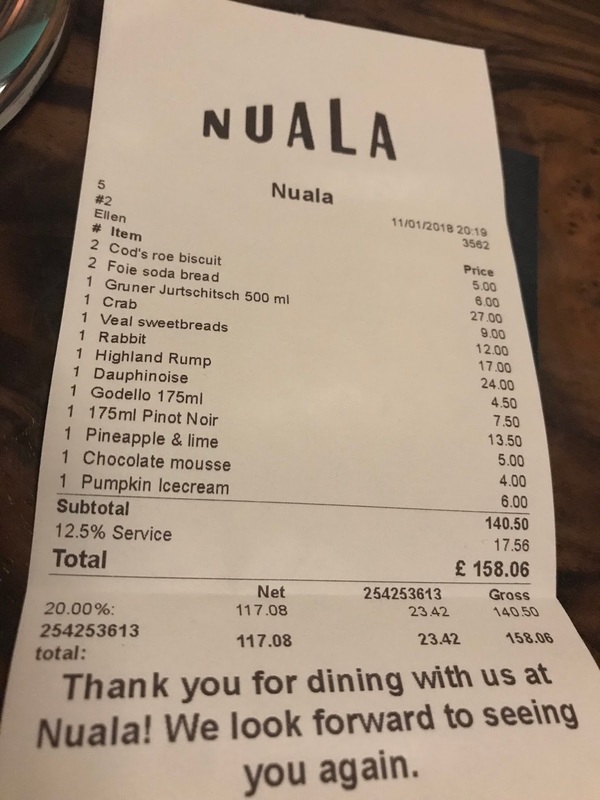 This being an invite, we didn't see a bill but doing a quick bit of maths now I don't think the total (with a bottle of wine and a gin & tonic) would have pushed much north of £40/head, which puts it firmly in that category of Good Local Restaurant I mentioned earlier. We need as many places like this as possible, on high streets up and down the country, and we need people to know about them and spend their money at them, to save Britain from Chain Hell. One day every small town could have a Corner House, and wouldn't that be wonderful? I was invited to the Corner House, and didn't see a bill. Immaculately specced rooms upstairs start at £79/night, which seems like a bargain to me. Also Canterbury is achingly pretty, and well worth a trip. It's a sign of just how old I and my peer group in London are getting that meals in fancy new restaurants often begin with a period of reminiscing about the previous use - or uses - of the building we happen to find ourselves in. I remember this particular spot on City Road, when I worked in the area in around 2008, being home to an all-you-can-eat Chinese buffet, but my dining companion last night's knowledge of the area stretches back even further, to when it was apparently a grim, bare-bones nightclub with blacked-out windows and murky reputation. That was when you'd occasionally catch Noel Fielding in the Dragon Bar just over the road, and a pint cost £4. Yes, that far back. Anyway, in the now-almost-unrecognisable Silicon Roundabout, up pops Nuala, as flashy and "designed" as befits the area but with a welcome as warm and kind as an Irish mammy. Yes, Nuala takes a certain inspiration from the Emerald Isle as head chef Niall Davidson (formerly of, well, lots of places but most recently Chiltern Firehouse) hails from there, but the menu is far from traditional and has rather more Dalston than Dalkey about it. The friendliness and charm of the front of house, though, seems very Irish. From "Snacks" (you'll know how the menu is organised if you've eaten at another cutting-edge British-Irish restaurant, the Dairy, in the last few years) we tried cod's roe crackers, superb smooth, salty tarama on top of delicate corn crisps, and neat discs of home made soda bread, sweet and soft, topped with shavings of foie gras and enchanting ribbons of preserved clementine. "Crab salad in chilled cucumber broth" performed the intricate task of balancing white and brown crab meat utterly perfectly - just enough brown to have that earthy umami kick, sweetened with just the right amount of white - and the "broth" - in fact more like a gel - had a clean, defined cucumber taste. It was the kind of crab dish you always hope to find on a menu like this, but it's by no means a given that every kitchen can pull it off. Nuala managed it though. Then the best sweetbreads I can remember eating in a long time. Huge, beautiful things, glazed with a superb meaty jus and without a hint of the mealiness that can affect lesser examples, they would have been astonishingly successful even without the "cauliflower rarebit", rich and smokey from the open grill, which accompanied them. Much like the crab dish, you hope when you see something like this on a menu it will live up to the promise, but only very rarely is it realised quite so brilliantly. Rabbit is another tricky meat to get right - cooked well, it can be lean and gamey without being dry, but I've lost count of the number of times I've been presented with vaguely rabbity lumps of cotton wool, in otherwise even quite accomplished restaurants. Needless to say, at Nuala they know what they're doing with a bit of bunny, and a lovely grilled leg was presented alongside a couple of medallions of stuffed loin, all of it beautifully moist. Chunks of salt-baked celeriac sat in a subtle cream sauce studded with samphire, and added up to a very rewarding plate of food indeed. Even superficially more straightforward dishes had plenty to recommend them. True, rump is often a chewier cut of cow, ordered often with the tacit understanding that whatever you lose in texture you'll gain in taste. And yes, although it took a bit of chewing, the taste from this beautiful bit of steak, Torloisk Highland cattle cooked to medium-rare over the coals and funky with a good deal of dry-aging, was well worth the effort and then some. This producer is a new one to me, but I will certainly be looking out for it on menus in the future. ...pumpkin ice cream boasted a fantastic sliky-smooth texture that only the very best home made ice cream has, and a chocolate and coffee affair had a nice big caffeine kick paired with cool, light dairy. All of it was polished off so thoroughly they could have re-used the artful stoneware without use of a pot-washer. There's a lot of pessmism blowing aroud the London restaurant scene lately. Some of it, no doubt, is well-founded; the effect Brexit will have on our ability to attract quality talent from Europe and the world is yet to be quantified, and ingredient inflation is already making things very difficult for Spanish and Italian restaurants (and many others) who import much of their menus. But however easy it is to succumb to fear and despair, and however much the following months and years may give us reason to do so, it seems London's restaurants, for now, have decided to just sod it all and carry on being brilliant anyway. So, the best advice I can give is to make a booking at Nuala immediately and make the bloody most of it. In 2005 I moved to Battersea and, for a while, there was nowhere decent nearby to eat. Actually, that's not strictly true - the Greyhound on Battersea High St had a decent stab at being a sort of Antipodean gastropub for a while, though they'd perhaps misjudged the area's level of gentrification at the time as I distinctly remember being pelted with gravel by a gang of feral youths as I attempted to dine al fresco. Sadly the Greyhound and, less sadly, the youths, moved on. A little later, the Fox and Hounds on Latchmere Road became our go-to local, and for a while was notable as the only pub in the area that refused to serve a burger and/or chips. Indeed, it still serves a mainly Italian selection of dishes (burrata, risotto, pasta) although sadly (again...) the standard of food dipped quite heavily when a certain chef quit around 2008 and is now really only worth visiting for the lovely beer garden out back. They now do a burger. With chips. You can imagine my delight, then, when Mien Tay opened in 2009. on Lavender Hill. In stark contrast to the collection of half-assed pizza/kebab joints, fish & chip shops and bland curry houses that were their neighbours on this unlovely stretch of road, Mien Tay was a Proper Vietnamese Restaurant, serving fresh summer rolls, honey-glazed quail dipped in lime and salt and sizzling plates of spiced lamb and fried onions, in a cosy (if not always comfortable - blimey they love to keep those radiators on full blast) family-run space. It was - and crucially still is - a great little restaurant, and I go all the time. Mien Tay could, I'm sure, have used their acquisition of one of the aforementioned half-assed fish & chip shops next door (it was called Salisbury's, if you care, which you shouldn't) as a kind of Mien Tay spillover, as the mothership quite understandably gets so slammed on weekday evenings. Instead, the concept is something genuinely new to London - a fiercely authentic (or so I'm led to believe) replica of the kind of grill restaurant you'd find in South West Vietnam, complete with laminated menus full of offal, seafood and grilled meats, and enough unusual eye-catching specialities to make any blogger's head spin. As a blogger, then, and therefore someone with a compulsive habit of ordering the most unusual items on any given menu whether I think I'll like it or not, we started with chicken gizzards. These were, as chicken gizzards always are, quite alarmingly crunchy and without a great deal of flavour, although the fruit/lime dip they came with was lovely and it was all clearly very well done, at least as much as gizzards can be. I'm not going to complain about ordering chicken gizzards and then being given chicken gizzards, because that would be deeply unfair. If you love chicken gizzards, these are the chicken gizzards for you. But what came next was much more to our tastes. Bivalves and cheese is a pairing that has a certain precedent in Western cooking - oysters "Rockefeller"[see edit] is a steakhouse starter staple - but here, treated to a cleverly balanced sauce and grilled just to the point where they're hot but the oysters themselves are plump and full of briney flavour, the match makes even more perfect sense. Apparently these delicacies are sold roadside in the region of Vietnam called (what else) Mien Tay, and their successful reproduction in London relies on only the largest oysters being available from Billingsgate. It's dishes like this, something (as far as I know) genuinely new on our shores that must have taken a certain amount of bravery to add to a menu in SW11 in 2018, that make you thank the stars that at least not everyone is running shy from innovation. A gamble for them, and us, that paid off wonderfully. Lamb chops were somewhat more straightforward but hardly less enjoyable. Pink inside and touched with a charcoal char, they were listed with the suggestion "try with our sticky rice cakes" and so having ordered said rice cakes separately we were surprised to find the chops came with them anyway. So we ended up with quite a few rice cakes. Still, they were nice rice cakes so no harm done. House pickles were excellent, particularly lemongrass which had a heavenly aromatic flavour perfectly offset by a sweet brine, and some sticks of turnip which had a pungent, complex character all of their own. Even more than places that make their own bread, I increasingly find that restaurants that do their own house pickling, brining and fermenting have their efforts rewarded tenfold. This was top pickle work. Of course, we couldn't ignore the banh mi section of the menu and so ordered the "traditional" as a good test of their sandwich abilities. Filled with cracklingly fresh herbs, with more of those super house pickles and containing a generous amount of salty, smoky pork, this was about as good an example of this kind of thing as I've had in many a year. Even the bread was just right, fragile enough to allow complete satisfying bites containing all the filling, without sacrificing any structural integrity. I may have mentioned how close this places is to my house, but crucially it's also directly on my commute home from work. I see lots of banh mi in my future. The bill for two people, with four beers and an extra banh mi to go (well why not) came to £56, perhaps not as bargain-basement cheap as Mien Tay was in its early years but still fantastic value for careful, fun, innovative cooking of this level. Yes, thirteen years after I moved to Battersea of course I wish there were more, and better places to eat in the area, but when somewhere like this comes along that allows me, even for a while, to ignore the other dross on Lavender Hill and pretend I live a few steps away from the foodie hub of Kingsland Road, well, they have my eternal gratitude. Any curious Londoner should find something to challenge and excite them in Mrs Le's Banh Mi and Grill; for local Battersea residents though, this is something very special indeed. EDIT: Apparently Oysters Rockefeller doesn't involve cheese. I don't know why I thought it did. Sorry.